A science fiction adventure novel, A Beginner’s Guide to Invading Earth tells the story of a reclusive ex-computer programmer who is the unwitting central figure of a plot to keep humanity from ever making first contact. 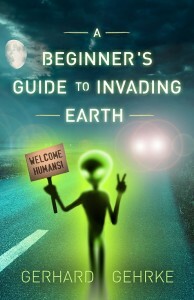 A Beginner’s Guide to Invading Earth began in my work truck’s notebook with the line “No one likes them very much.” This was to be the conclusion reached by aliens intent on first contact who reached the USA and decided to try other parts of the planet after some unfortunate experiences. This became the aliens wanting nothing to do with the entire planet and them hanging a virtual “Do Not Disturb Occupants” sign on our doorknob. As I fleshed this out over a few months I decided a more focused story that centered on one man’s experience as a scapegoat for an alien conspiracy just felt better. By then I had a rough idea on where I wanted the project to go. For emotional honesty each character has a part of me in them. The main character Jeff Abel is paranoid and fearful of technology, which is understandable considering the revelations in recent years about NSA spying. The second lead character Jordan is faced with the temptation to betray her own kind in exchange for being taken from Earth. How many of us wouldn’t at least be tempted to give up everything for a chance to experience something no other human has. And the main villain is just frustrated in doing a job that no one understands and no one appreciates and that has driven him a bit loony. Three aliens sat together in a booth of the bar and grill, not eating the food before them. The two adults stared down at their plates with disbelief, a greasy burger with two floppy strips of bacon and a square of droopy orange cheese in front of one, a meatloaf special featuring a discharge of thick white gravy hiding two lumps of something next to a side of a leaf of iceberg lettuce and a tomato slice before the other. The third alien was a toddler a bit too big for the booster chair she was strapped into. Her footed pajamas with the “Phone Home!” and “Beam Me Up” slogans were stained by the cran-whatever juice in her sippy cup. Her alien antennae headband had slipped to the back of her head. The husband and wife’s sparkly blue makeup looked less than fresh, faded, and streaked. Their tour of the world’s loneliest highway’s UFO sites and the Lovelock, Nevada First Annual UFO Con was at an end, and the meal before them was a final insult on a long day. The toddler fussed, burbled, and started to cry. Jeff Abel bussed the table nearby, placing beer mugs, bottles, and ketchup-smeared plates into a grey plastic bin. The male member of the Family Von Alien grabbed Jeff’s arm and tugged. Jeff wasn’t a small man, but he let himself be dragged. The man wore glasses, which made his eyeballs look bulgy and big as he looked up at Jeff. The woman said, “And why are there people smoking in here? It’s not legal. The smoke is bothering our baby.” She gestured about them with long, blue nail-polished fingernails. Jeff looked at the toddler. She was at least two, maybe almost three, going on pork chop, and looking generally upset about everything. No one in the dining room smoked, but the attached bar had a handful of patrons, and two held burning cigarettes alongside their beer. A thin haze meandered through the dark wood rafters of the establishment, hanging over bar patrons and diners alike. From the walls of the dining room, the mounted heads of a mule deer and a six-point elk buck looked on impassively. But the bar and grill smelled of cigarettes even out in the parking lot, so the smell of smoke inside shouldn’t have been a surprise. “A salad,” the woman said. She wouldn’t make eye contact. Jeff was used to that. His exotropia caused his right eye to look slightly off and away, wall-eyed some would say, as if he were a fish. People didn’t know where to look sometimes when talking to him. Some didn’t look at him at all. The woman made a non-committal noise. Her blue fingernails drummed on the table. Jeff grabbed his bin with the dirty dishes. Jeff went to the kitchen. Only one cook worked behind the stainless steel station. He presided over a burger patty that sizzled away on a hard top grill and a batch of fries swimming in a fryer. The short, brown-skinned cook grinned when Jeff came in. “Hey, Masaya, I’m going to make a salad for table four,” Jeff said. “Tell Stacy to do it,” Masaya said. Jeff washed his hands and got out a cutting board and a chef’s knife. He found a cucumber and some strawberries in the walk-in, along with a sealed packet of feta cheese.. He peeled the cucumber with a peeler, chopped off the ends, and scored the sides with a fork. He then cut it into neat slices and put it into a small bowl. Also into the bowl went sliced strawberries. He sprinkled the berries and cucumber with some balsamic, a pinch of sugar, and some dry dill. He tossed it with his hands. On a small plate, he arranged it all into a collapsed column. Some of the cheese went on top. On the side, he put a pair of cherry tomatoes. “Voila,” Jeff said and showed Masaya the salad. The cook smiled, nodded, and went back to his burger, plating the buns and fixings for his next victim. Jeff walked out into the dining room. The family of three was gone. In their place stood a tall, blond woman in a waitress costume, looking at the table with the two abandoned meals, and then at Jeff. Her ice blue eyes narrowed. She didn’t have a problem with staring Jeff in the face. “Where are they?” Stacy said. Jeff looked around. Two other tables had diners, the rest were vacant. The family of three hadn’t changed tables, nor were they at the front counter waiting to pay. “And what’s that?” Stacy indicated the salad. She looked down at the arrangement of the cucumber and strawberry salad and screwed up her face. “You cost me a tip.” She turned and marched into the kitchen. Jeff bussed the burger, the meatloaf special, and the two salads. At the end of the shift, once the last bar patron left the place, Jeff swamped the floor and started to mop. Masaya sat on a stool with his back against the bar, a bottle of Mexican beer in his hands. He watched Jeff work. “Stacy pay you your share of tips?” Masaya said. Jeff shook his head. He wrung the water into the bucket, pulled the bucket along on its casters to the next spot to be mopped. “She got stiffed on a table,” Jeff said. Jeff shrugged. The owner came through the door from the stairs that led up to the office. He was squat and round with too much hair on the sides of his head and not enough in the middle. Masaya hid the beer behind a greasy, white pant leg. The owner ignored him, didn’t look at Jeff. “You’ll lock up when you’re both done cleaning up?” the owner asked. The owner headed for the door. “Uh, Mr. Carlson?” Jeff said.